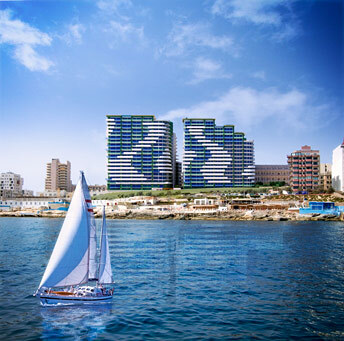 Situated on the Tigné Peninsula of Sliema, the most upmarket area in Malta, Fort Cambridge seafront apartments in Malta, benefit from one of Malta’s most select locations. In recent years, Sliema has become a hive of activity with a variety of businesses setting up shop along its busy streets. Designer outlets, restaurants and bars mean you’re never far from anything you need in these seafront apartments in Malta. Sliema boasts a long promenade that stretches the length of the coast to the neighbouring town of St. Julian’s. Brimming with people and colourful café’s, it is also a popular bathing spot with visitors and locals alike. The town enjoys amble transport links to all areas of the islands as well as a ferry service to the capital of Malta, Valletta.